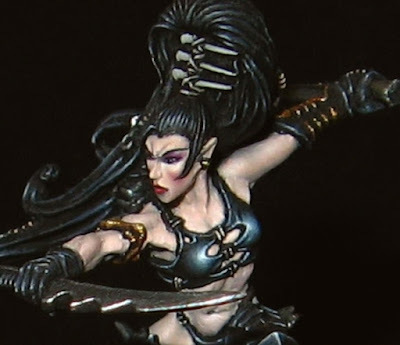 I really like the subtlety and monochromatic color scheme used in this model. Normally I feel like giving a mini all black clothing would look rather boring, but here I think it compliments the pal skin nicely. 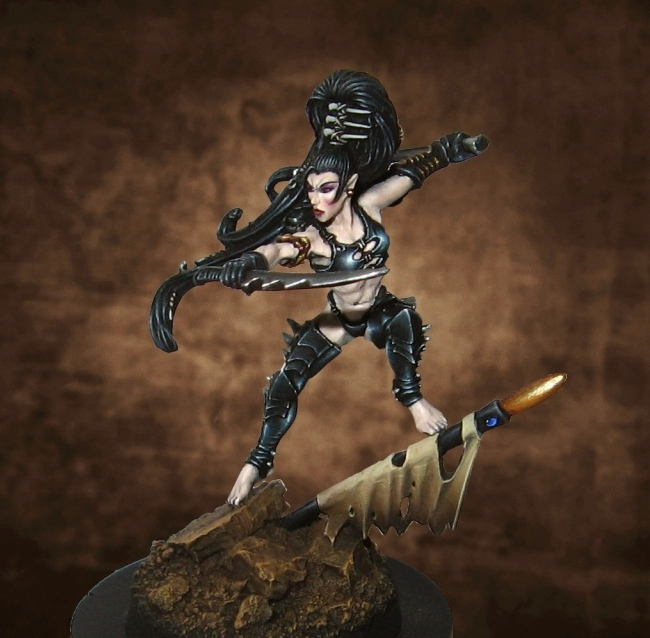 It also highlights the dark world view of the Dark Eldar nicely. Let's face it, if they were ever in a Hollywood movie, they would all be wearing black. The leather, armor, and hair all have enough of a color difference and technique difference to make them stand apart from each other. It would have been fairly easy for all of it to look the same, but they really managed to give each different material a distinct color and texture. The leather has a blueish tint to it and a much softer highlight, where as the armor is a flat black highlighted with a more traditional grey. The skin is expertly done as well. I like how it's shaded with a blue or purple tint, yet still looks like realistic pale skin. The crowning achievement for me is how they managed to paint so much expression onto her face. She really looks quite angry and determined, and correct me if I'm wrong, but I'm pretty sure the actual model doesn't have that furrowed brow sculpted on. This is such a cool mini and it sits perfectly within a realistic world.